Pleading the Sixth: A new bill creating a statewide public defense commission was entered into the Idaho House of Representatives in early February 2014. The bill is the recommendation of a legislative interim committee on public defense reform that studied systemic deficiencies in 2013. Importantly, the bill specifically bans the practice of flat fee contracting – a ban the state’s chief justice has been a vocal supporter of. 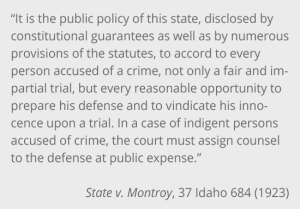 “Idaho’s public defender system today has significant deficiencies; it is a patchwork of offices and contracts paid for by our already cash starved counties,” stated Chief Justice Roger Burdick in his annual State of the Judiciary address before the Idaho Legislature on January 21, 2014. Though the address was an opportunity to once again call for “eliminating single fixed fee contracts,” the focus of the speech was congratulatory of the work of the Legislative Interim Committee on Public Defense Reform for proposing legislation that will “provide a solid first step in meeting our constitutional requirements.” The Co-Chair of the Committee, Rep. Darrell Bolz (R), subsequently entered House Bill 454 on February 6th, seeking the establishment of, among other things, an independent, statewide public defense commission and the first ever state funding for trial level indigent defense services. 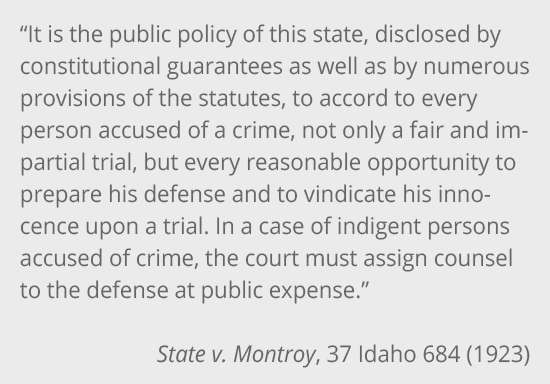 Idaho is one of just eight states that currently require its counties to shoulder the entire burden of administering and funding trial-level indigent defense services. Although a couple of the more populous counties [Ada County (Boise) and Kootenai County (Coeur D’Alene) as examples] main­tain traditional public defender offices with full time staff attorneys, most of the other 42 counties provide services through contract defenders or assigned counsel systems. State fiscal support and state oversight is limited to appel­late representation alone. The Office of the State Appellate Public Defender (SAPD) is an execu­tive branch agency that provides appellate representation in felony cases (including post-convic­tion and state habeas cases). In Ferri v. Ackerman, the U.S. Supreme Court states that “independence” of appointed counsel to act as an adversary is an “indispensible element” of “effective representation.” This is confirmed in Strickland v. Washington’s statements that “independence of counsel” is “constitutionally protected,” and that “[g]overnment violates the right to effective assistance when it interferes in certain ways with the ability of counsel to make independent decisions about how to conduct the defense.” However, the independence of the defense function is compromised daily in Idaho where private attorneys handle an unlimited number of cases for a single flat fee under contract to a county administrator or the judge presiding over the lawyer’s cases in most jurisdictions. Such contractual arrangements are rife with financial incentives for lawyers to do as little work on cases as possible. Generally, all trial expenses (experts, investigators, etc.) must be paid out of the same flat fee meaning that a lawyer’s take home pay is negatively impacted the more outside assistance he seeks. Often, lawyers take into account what they must do to satisfy a judge or county administrator in order to get the next contract rather than advocating effectively on a defendant’s behalf. When lawyers triage the duty they owe each and every client, it is not uncommon for such attorneys to end up juggling several hundred cases all at the same time. Such contractual arrangements are banned under the American Bar Association, Ten Principles of a Public Defense Delivery System (Principle 8). Additionally, HB 454 creates a seven-person public defense commission within the Department of Self-Governing Agencies – a constitutional provision in Idaho which, though technically still in the Executive Branch, means that proposed commission will not have to answer directly to the Governor. The proposed statewide commission will have diverse appointing authorities to ensure that no one branch of government has undue influence over the actions of the commission. The commission will consist of: a member of the state senate; a member of the house of representatives; an appointee of the chief justice; three members appointed by the governor, and confirmed by the senate, from names submitted by the Idaho Association of Counties, the State Appellate Defender and the Idaho Juvenile Justice Commission. A fourth gubernatorial appointee must be an experienced criminal defense attorney. None of the appointees may be a prosecuting attorney or a current employee of a law enforcement agency. If enacted, the commission will have the power to hire an executive director and all additional staff as the commission deems necessary to complete the work of the commission. Compensation levels for the director and staff are the sole discretion of the commission. Under HB 454, the commission, director and staff are to immediately address the lack of public defense training in the state, specifically authorizing them to promulgate rules on training and continuing legal education to promote “competency and consistency” for the following case-types: criminal, juvenile, abuse and neglect, post-conviction, civil commitment, capital and civil contempt. This section is generally regarded as the authority for the commission to set specific performance standards that will inform attorneys about the parameters of ethical performance for each of the enumerated case-types, and then to establish a central training unit to train attorneys against said standards. The other immediate authority under HB 454 is for the commission is to promulgate binding data collection requirements. During their work, the Legislative Interim Committee was generally concerned about the lack of the most basic information available from the current county-based indigent defense providers related to caseload. HB 454 gives the commission authority to establish how workload is to be tracked and reported. Importantly, HB 454 establishes the first ever state public defense fund consisting of money appropriated by the legislature to a) meet the needs of the commission and, b) offer grant money to defense attorneys to meet the training requirements set forth by the commission. Though the Legislative Interim Committee discussed further areas in which the commission should have the authority to promulgate standards (including attorney qualifications, supervision, and workload), the Committee members were concerned that the amount of time it takes to appoint a commission, set a meeting schedule, hire an executive director, instruct the director to hire necessary staff, and accomplish the immediate goals of training and data collection, would all take more than a year to accomplish. As such, the Legislative Committee recommended a new concurrent resolution be adopted to allow the Legislative Committee to continue their work for another year while the public defense commission gets set up and running. The specific mission for the next year is to focus on: a) determining appropriate funding levels needed to bring county programs into compliance with proposed commission standards; and b) “effective enforcement mechanisms to ensure compliance with public defense system standards and requirements.” One idea that is being given serious consideration was put forth by Kootenai County, Board of County Commissioners member Daniel Green in a letter to 6AC Executive Director, David Carroll on August 13, 2013, which was also presented to the legislative committee. Given the extreme difficulty Kootenai County Commissioners have had dealing with complex constitutional issues for which they have had no formal training, Mr. Green suggests that the committee should consider “a ‘reverse’ revenue sharing plan where the counties would fund a state indigent defense system by paying their prorated share to the state. The state could provide defense by county or districts.” The idea appears to be gaining support from other counties. “We must maintain our commitment to Idaho’s constitution and history,” Chief Justice Burdick stated in January as he reminded policymakers that the right to an attorney in felony and misdemeanor cases “was not a case foisted on Idaho by federal mandate of the United States Supreme Court or Congress, but our own court interpreting our own constitution and statutes – statutes dating back to territorial days.” Given the support of the Chief Justice and the leadership of the Legislative Interim Committee members, the 6AC does not anticipate many more hurdles as HB 454 makes its way through the legislature. We will keep you abreast of its progress. Our blog PLEADING THE SIXTH explains what you've just read in the news, providing historical, legal, and standards-based context to our nation's ongoing efforts to provide a meaningful right to counsel. We present the facts you need to know about Sixth Amendment case law, standards, and litigation in the FACTS & RESOURCES section of our website. The RIGHT TO COUNSEL TODAY section explains our country's successes and failures in providing the right to counsel today. To learn about how the right to counsel is applied in your state or territory, visit KNOW YOUR STATE. For information about the Sixth Amendment Center and its ongoing work to ensure that every person receives constitutionally effective counsel, browse the 6AC & OUR WORK section. Want to receive an email notification whenever we add a Pleading the Sixth post? Please sign up using the form below.